.. well tomorrow, only problem is the big list of things to do that are not checked off, so this is what I have to finish today. Matilda Jane is minus a sleeve and so far the button search has been fruitless, though I do have ribbon for the back. All the sewing of hems might be a long job though! AND I am kinda worried she might be a bit on the neat side, AND do I have time to wash and block her, not really! Just a little problem there! Skirt to match MJ, finished apart from a little hand-sewing and cutting all the loose threads off. Jacket, currently still in 2 layers, lining and wool have to be sewn together and one buttonhole done. 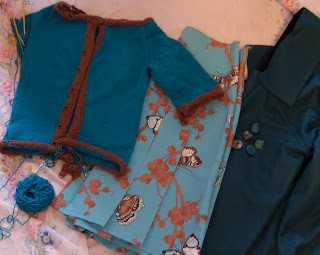 I have a choice of buttons as I couldn’t make up my mind when I button shopped for the jacket so have 5 to choose from! I also have to food shop/cook for today and tomorrow as Jim will be at work, not that I think my boys are capable of starving themselves to death, it just might keep the arguing down to a quiet roar. Excellent – I’m dying to see your MJ. Might spur me on to start mine. If you’re still planning the SECC for Saturday, let me know what time. I should be able to sneak in for a quick visit ! looking forward to seeing you – I remembered to pack the Felted Tweed! A quiet day at the show today due to the Rail Signalmen on strike – it was fun to have time to talk to the stall holders and look at the exhibits.